Are you purchasing your first set of drums, but you aren’t sure what type of hardware you need to buy? The type of hardware you should get depends on the drum set you have. It also depends a lot on the style of music you play, and if you will be on the road. A sleek look with two side-only sections that leave the front of the drum set free of the horizontal bars. Modular design allows you to spend less money on a rack and add your own stands to it. Playing the drums for over thirty years, I know what types of hardware that I definitely like, and those that I don’t. It does depend a lot on how you plan to use the hardware, so keep that in the back of your mind as you shop. If you are taking your drums to gigs, you want something that will store well in a vehicle, and is easy to carry around. There are definitely budget friendly packs that you can pick up if you are a beginner, and lightweight stands that are great when you are out on the road. Make sure the hardware you choose matches your lifestyle, since you don’t want to get a heavy rack that you have to put together each time you play a gig. If you plan to gig a lot, you will need hardware that is double-braced for its durability and convenient storing. Your budget will also help you determine what type of hardware you should get, so there is a lot to consider while you do your research. 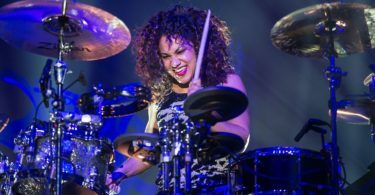 Here are a few tips on what to look for in the best drum and percussion stand and racks, and a few reviews to help you start shopping. 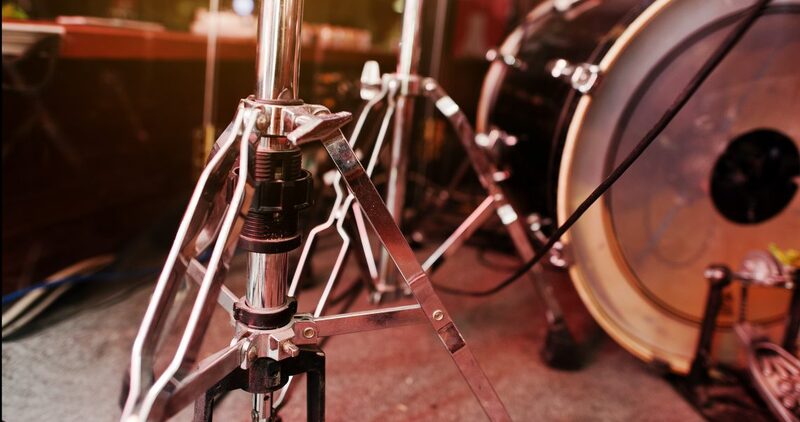 A boom stand is a little more flexible in your drum setup than a straight stand. It comes with an arm that is extendable that lets you adjust the cymbal position easily. A straight stand is also called a cymbal stand, and it just goes straight up and down. 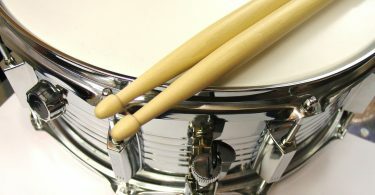 Straight stands can be used between the toms and hi-hat, and the boom stand can be used for the ride and second cymbal. There are also convertible stands that are used for either a boom stand or a straight stand, so it is an interchangeable and versatile addition to your set. Double braced hardware is considered more durable than single braced hardware, but it is not necessarily the more stable of the two. Single braced is lighter and easy to carry around, but the double braced can take more of a beating, so it is better if you are out on the road and your hardware is getting knocked around some. Double braced hardware can also withstand more weight, so it can take the extra weight of an additional tom if you wanted to add that to your cymbal stand. If you are looking into a budget stand, most of them can be used moderately for several years of playing, as long as they are taken care of. It is a good idea to open and close the tripod on a stand to see how well the stand is made. You will be happy you checked that now instead of having the lock on the stand not work properly after just a few months. There are some stands, like hi-hat stands, that have finer adjustability and more features than others, so make sure to test the ones that you are interested to find the one that is most comfortable for you. Budget stands are usually purchased by beginners, so they are more than likely not going to be out playing shows each night, so they don’t need to be too durable, but durable enough to withstand moderate use. Obviously, heavy-duty stands are large and heavy, and they will give you a lot more stability than budget stands. The tubes on these stands are thicker in diameter, and the double braced tripods will make the stand stronger and more rigid. With this added strength, your boom arms can be longer and can hold extra things that can be clamped off from a single stand. Keep in mind thought that at the end of the night, all that versatility in a heavy-duty stand has to be taken apart and then carried and stored each night. Memory locks that have the awesome feature of allowing you to set up your stand at the exact same height each night will lose their telescopic feature when you break it down as your stand will be in several pieces. If you are thinking about buying a drum rack, you need to consider what size you want, the configuration, if you will want to expand it, and, if you are on the road a lot, how easy it is to transport it. It is never a bad idea to do a little research into the rack and the manufacturer, and you also want to make sure that it has a good warrant and that you can easily buy replacement parts. It’s vital is to make sure it is strong enough that it will support the weight of all your drums, plus stable enough that it will stay up during the entire set. Drummers that like more stability and easy setup tend to prefer drum racks as they provide a much smaller footprint. If you have a lot of floor toms, rack toms, and cymbals, all those stands can take up a lot of space, plus time to set up. These different stands can also tend to start to move while you are playing from vibrations, depending on your playing style, so you can spend the entire gig having to continually readjust your set. If you are out on the road, a larger kit with all these different components can take a while to setup and tear down versus using a drum rack. 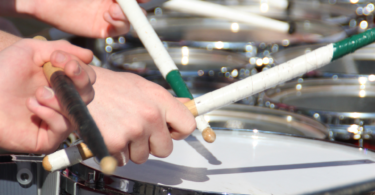 Drum racks are usually made with tubular steel, and they also tend to be stronger. Rubber bumpers on their feet lessen creeping while you are playing, but you should still consider placing the rack on a drum rug to keep everything in one place. A preconfigured drum rack that comes with clamps and arms is great for those musicians that already have a pretty modest sized drum set and do not plan to expand it. 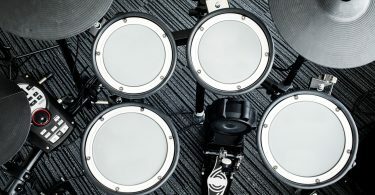 If you have a tight budget, but do plan to expand in the future, you may want to consider buying a drum rack one piece at a time. Most manufacturers offer drum racks that can expand to add another snare drum, cymbals, or floor toms. These additional pieces can be purchased and added when you need them. Most hardware made today is constructed with the highest quality parts and execution. So, when you are choosing a stand, you are really looking more at preference than brand dominance. The Gibraltar Stealth Rack is a very effective, simple concept. It has a sleek look that focuses your attention on the drum kit, and its modular design means that you can spend the least amount of money on it and then add your existing stands to the rack. 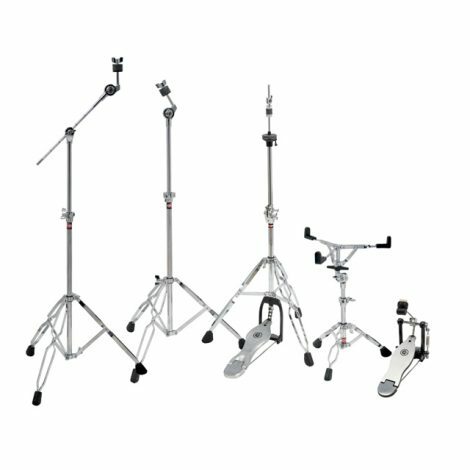 This is a great option for those drummers that detest standard racks, and they also get rid of the many tripods that can clutter up the area for you stand based kit. Stealth Rack is designed to keeps the horizontal drum parts of the low enough and to the sides of the kit. You get a clear view of the drums with this setup, which is nice if you have a distinctive or decorative finish on your drums. Assembled with regular Gibraltar chrome-plated steel tubing, the tubes on the Stealth Rack are fairly sizable, but, since they are hollow, they are fairly lightweight. In a time when manufacturers are using square and hexagonal rack tubing, Gibraltar continues to use the standard is circular bars. The round bars also keep up the continuity of the stands and existing hardware of your kit helping it to blend in well with the rest of your drum set, and the shiny bars help to reflect the finish of your drums even more. Unlike standard racks that span the sides and front of a kit, the Stealth Rack has two side-only sections that leave the front of the drum set free of the horizontal bars. These are not identical sides since they have different purposes, but they are both based on a set of tubes that are fitted upright with feet that attach to a horizontal bar. The rack on the snare side is called the Stealth Vertical Mounting System that has a standard sized upright and a shortened upright that has a narrow foot. 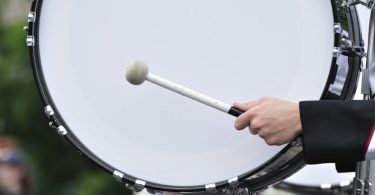 The horizontal tube is positioned so that it is running into your playing area from the front of your bass drum. The larger upright end and foot are placed the farthest away from you, so it can hold either a single or double tom arm. Closest to you is the snare stand that can be placed into the smaller upright. The smaller foot does not interfere with your pedal action, and the bar has two uprights that are linked with a slight curve on one end that is meant to curve over the connecting rod to the double bass pedal. A pair of 90-degree clamps that are easy to fit and tighten attach the horizontal and vertical bars to each other. The GSVMS-KIT has all the parts of a GSVMS plus a tom arm and snare basket. The basic GSVMS has three sets of plastic collars that can fasten into the top of the uprights with locks. They have various diameters that will work with pretty much any stand available helping you to save money by using your own stands. The other side of the kit is the Stealth Side Mount System that is made of two identical uprights connected with a straight horizontal bar. The uprights will both take any type of stand. You can also attach extra mounting posts and boom arms on the GSSMS. You can either use the special Gibraltar clamp or regular clamps on the narrower boom section that are also at the advantage of being higher up. Plus, the Ultra Adjust boom arms are ingenious and definitely worth using. The Stealth Rack is available in the mid $200 range. The Ludwig Atlas Pro is an affordably priced set of hardware that includes all the features you need for medium sized to large sized clubs. They are also lightweight, so they are easy to carry around when you are out on the road. The snare stand and hi-hat stand are functional and innovative. The Atlas series is known for its durability and high-quality. Their functional equipment has that awesome Ludwig quality that will more than get the job done. You know when you buy Ludwig’s Atlas 5-piece hardware pack that you are getting great value at an affordable price. This set is available in the low $300 range. The DW Airlift Snare Stands are simple, but they have a brilliant design. 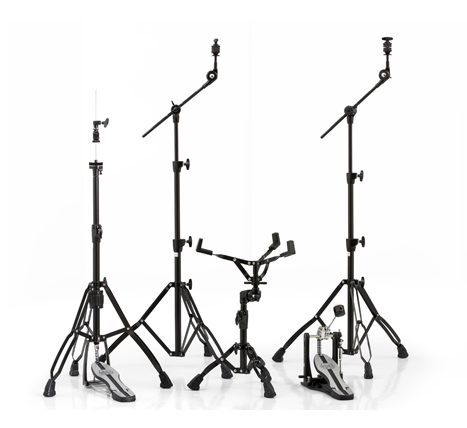 The Airlift tom and snare stands were created based on the 9000 Series stands with a mechanically straightforward design. Without the weight of a drum, pushing the top tube inside the base tube is a little difficult, but once the drum is added, everything just balances out. 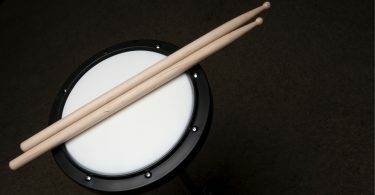 The drums feel like they are floating on air, and it is easy to push or pull them in height that you prefer with a single, one-handed movement. The Airlift gives you tons of control with just a few fingers to set the tom height or raise the snare. Even though they are simple to adjust, they are still substantial pieces that don’t need lubricating or maintenance, plus they can be separated for storing. They are very user-friendly, but the snare stand is a bit of a stretch in price, falling into the $300 range. 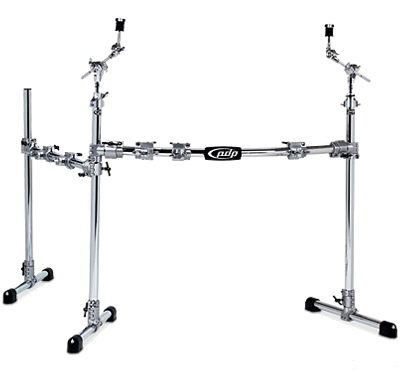 The Pearl DR-503C Drum Rack is similar to Pearl’s popular rack option DR-503C, but it is curved. These curved bars let you have closer drum placement, and it gives you a more rounded visual appearance and feels. It has flexible adjustments to its height, plus it has square tubing that is 100% slip-proof. All the bars on the ICON hardware will adjust in countless ways, and can be independently position along the 34″ tall legs, so it can accommodate up to 28” in diameter bass drums. It also features memory clamps that are “set and forget”, so that you can repeatedly have fast set up without using tools. 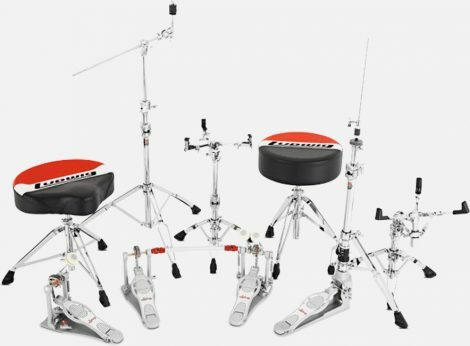 The Pearl DR-503C rack system is also outfitted with both a front section and two side sections, and it includes four PCX-100 clamps and two PCL-100 Pipe Clamps that are attachable at the tops of the legs to hold toms and cymbals. All of the rack bars are a uniform 36” long for easier storage and portability. The Pearl DR-503C rack system is available in the mid $400 to low $500 range. 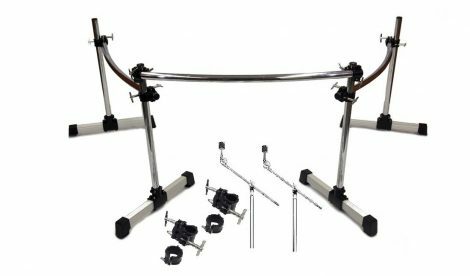 The Deluxe Drum Rack Kit 3 Section 25 Piece Set Cymbal Boom Arms, Clamps HD Chrome is a 25 piece kit that comes with three sections, four post setups including three horizontally curved bars that provide up to twelve feet of space for your entire drum kit, plus cymbals and accessories. The three horizontal crossbars measure 48” long and have a 1.5” diameter, and the four upright legs are 32” long with a 1.5” diameter. The rack comes with aluminum feet that include rubber boots to prevent the kit from moving while you are playing as well as to help cushion the impact. The two memory clamps, six connector clamps, and two cymbal clamps are constructed with heavy duty cast and strong chrome hardware. There are also two cymbal boom arms that are constructed with heavy-duty chrome and steel, plus large wingnuts and felt pads. All of these pieces are constructed to withstand anything you can throw at them while you are on the road. It is available in the mid to high $200 range. 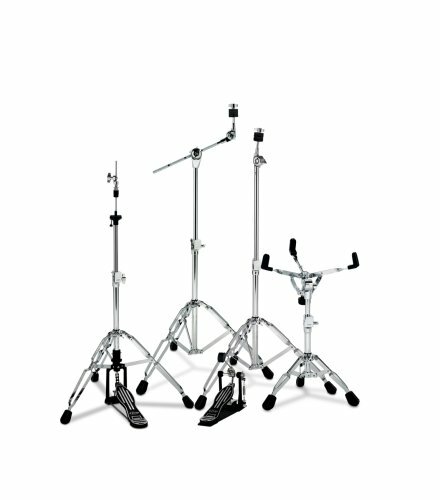 The Pacific Drums by DW Chrome Over Steel Main and Side Combo Rack is made with heavy-duty chrome-plated steel tubing, and it comes with a ton of reinforced clamps and other extras. You will find that the Main and Side Drum Rack Package is really durable, and its versatility can accommodate several diverse setups. It was created to be durable and modular that has features including a nameplate that is built-in to give you precise set-ups, TechLock locking screws, and soft-grip rubber feet that come with integrated spikes. The PDP V-clamps can accommodate different sized tubing, so they can be used with just about any type of hardware to give you extra flexibility. The Pacific Drums Main and Side Drum Rack Package is available in the mid $400 range. 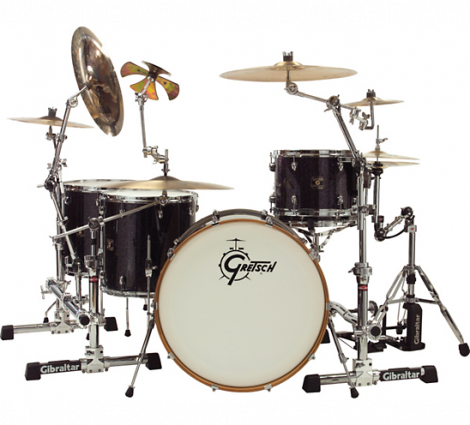 The Gibraltar 4700PK hardware pack has a boom stand, straight cymbal stand, hi-hat stand, and snare stand. The snare stand has low mass, and it is double braced giving awesome stability, but remaining lightweight. It is created with nylon inserts at the connection points and at the cast hinged height adjustments. The hi-hat stand is a solid piece with a feel that is hard to find in competitor stands. It has double braced legs, deluxe hi-hat clutch, and hinged height adjustment that makes it a great stand for both beginners and professionals. The cymbal boom stand is also double braced, and it comes with hinged height adjustments. It is a sturdy stand that lets you place your cymbals right where you want them. It also gives you a hideaway boom that has fine tooth adjustments, and is also ideal for professionals or beginners. The straight cymbal stand also has hinged height adjustments, and it is double braced with nylon inserts for greater strength. The Gibraltar 4700PK hardware is available at the very low price of $210. The Tama Stage Master 5-piece Hardware Kit gives you solid playing action and the necessary stability for a very affordable price. 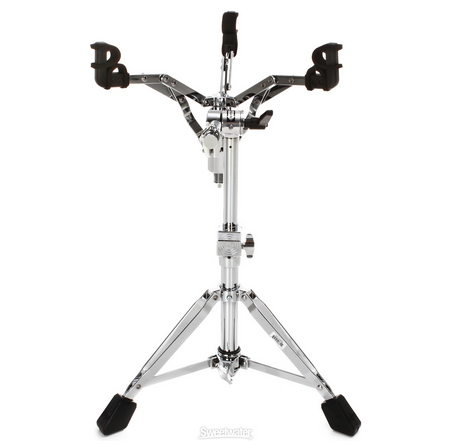 It comes with double braced legs that will keep your stands where you need them, plus you will get fine-gear tilters and convertible boom/straight cymbal stands as a bonus. All of these parts let you set up the drum kit the way you prefer. The Tama Stage Master 5-piece Hardware Kit is available in the mid $200. The Mapex Mars Single Pedal Hardware Pack has everything you will need to house your drum kit and cymbals. This is the companion pack to the Mars shell pack, although you can use this hardware with any other drum kit. This hardware is strong and lightweight, and it is great for professionals that are out on the road, or if you are looking to upgrade your beginner level equipment. It includes a multi-step snare basket tilter and basket adjuster that let you angle the snare any way that you want. It also has a clamp style memory lock that grasps the ideal height and holds it there for the future. The hi-hat stand has a direct pull chain-drive that is durable and smooth, plus it has variable tension adjustments that give you the weight and feel just where you want it. The stands come with floor spikes that keep them from sliding and concave double-braced legs that take up a lot less room when you are storing them folded up. The boom cymbal stands have knurled hideaway boom arms, plus curved double-braced legs that keep everything fitting nicely and neatly together. This hardware pack is available for around $300. Pacific Drums has great quality drums that get the job done. They also have a wide variety of cymbals, thrones, and stands to suit your need. 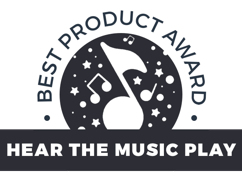 Their hardware package includes hi-hat stands that have double braced legs, large rubber feet, standard gauge tubing, and contoured wing screws. 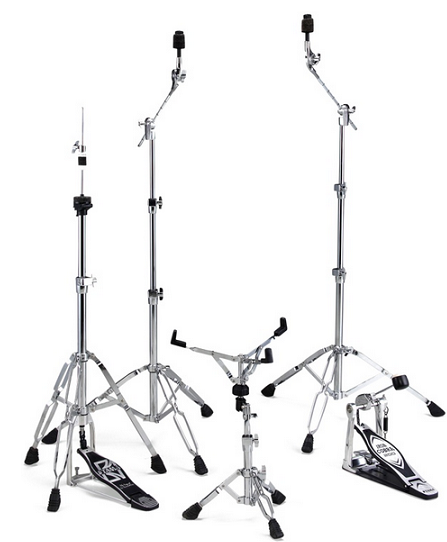 The boom cymbal stand, the straight cymbal stand, and the snare stand all feature double braced legs, contoured wing screws, standard gauge tubing, fine-toothed tilter, and oversized rubber feet. The Pacific 800 Series can come in the attractive Colorware styles. It is available for around $200.